Well, the last one lasted about 32k miles and about 2.5 years of daily driving combined with a number of track events, a couple quarter mile runs, Seattle hills, and general spirited driving. I started noticing slippage in 3rd and 4th gears about a month ago, so I knew it was time to get a new one installed. When I went with the Stage 3 clutch, our focus was on daily drivability while being able to handle the power of the supercharger. Stage 3 was with Kevlar, this Stage 3+ is now ceramic (both still utilizing the OE flywheel, which was resurfaced each clutch install). I'm told this one can handle significantly more power than the last, so we'll see how much I get out of her. Initial impression: it engages even lower than the prior clutch, which I do like, but it will take some getting used to after spending the last 2 years at a different engagement point. I'll be curious to see how I manage it on the daily hills, and have no doubt it'll handle the power just fine (I'm going to wait ~1k miles before really getting on it). With the SC on the horizon, a clutch upgrade was needed. After discussions with Jason, I decided on a stage 3 clutch from AMD. The car is bound to see some track time in the future, but it will spend the majority of its time as a daily driver. Handling the power is the obvious requirement, with drivability equally important. Initial impressions: I prefer it to stock, but still need to get used to it a bit. Clutch engagement happens much earlier i.e. closer to the floor than stock which I like. It's equal to stock in ease of getting rolling from a stop. There's minimal, just a hint of, chatter when going in reverse and sometimes noticeable if I'm on a tricky hill / driveway where I have to work it a bit (engage/disengage). As I'm breaking it in, I haven't really stressed it yet, but it feels strong / stronger than the stock one which, after inspection, was already on its way out. 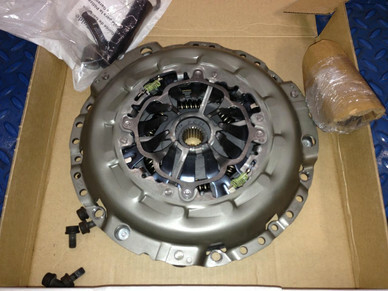 In addition to this clutch, I had the stock flywheel resurfaced.